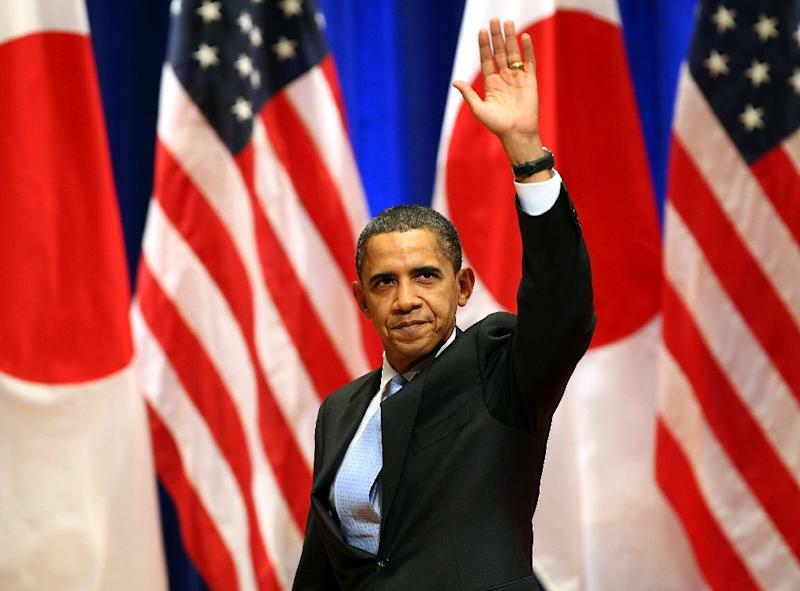 US President Barack Obama, pictured in Tokyo on November 14, 2009, said "As America's first Pacific president, I promise you that this Pacific nation will strengthen and sustain our leadership in this vitally important part of the world"
Washington (AFP) - The conclusion of an oft-delayed free trade agreement with Asia-Pacific nations is timely for Barack Obama, as it embodies the American president's earlier commitment: a pivot towards the globe's most populous continent. With dithering in the Middle East and in particular Syria triggering an avalanche of criticism, Obama can claim a genuine diplomatic success fewer than 16 months before the end of his presidency, provided that he can overcome the obstacle known as the US Congress. The centerpiece of his foreign policy, the rebalance or "pivot" to Asia popularized by Hillary Clinton when she served as secretary of state, is intended to devote more diplomatic, security and economic resources and attention to the continent after a decade monopolized by Middle East crises and costly wars in Afghanistan and Iraq. Monday's agreement "strengthens our strategic relationships with our partners and allies in a region that will be vital to the 21st century," Obama said. China notably is not party to the Trans-Pacific Partnership (TPP), which brings together 12 countries representing some 40 percent of the global economy. When he arrived in the White House nearly seven years ago, Obama showed his intent to chart a new course. "As America's first Pacific president, I promise you that this Pacific nation will strengthen and sustain our leadership in this vitally important part of the world," Obama said in Tokyo in November 2009 as he kicked off his first tour to Asia. "The future of the United States and Asia is inextricably linked," he insisted at the time, as he announced Washington's intent to "strengthen old alliances and build new partnerships" in the region. For Douglas Paal, of the Carnegie Endowment for International Peace, the trade pact sealed in Atlanta, Georgia provides "real new energy" to the rebalancing and boosts "the narrative for US engagement" in Asia. In previous decades one could argue that Washington was merely "continuing its post-World War II military engagement" in the region, whereas now the United States is strengthening its diplomatic efforts to reach the high water mark of the 1990s, said Paal, a former diplomat. 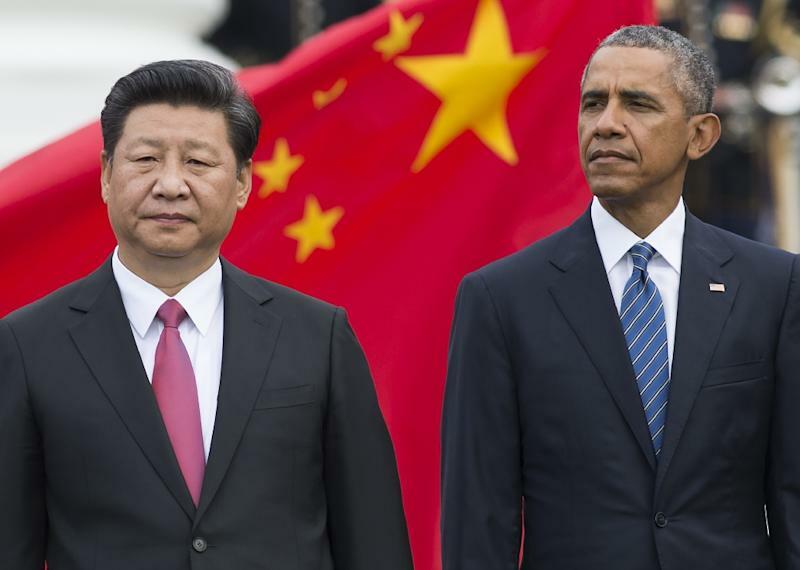 Ten days after Chinese President Xi Jinping visited Washington, where tense undercurrents marked his trip, Obama was careful to emphasize the need Monday for a regional counterweight against Beijing. "When more than 95 percent of our potential customers live outside our borders, we can't let countries like China write the rules of the global economy," Obama stressed. The remark has obvious domestic political reach. The president knows that getting Congress -- controlled by Republicans who are loathe to hand Obama a clear victory -- to back him on the trade deal will not be easy, and he intends to capitalize on the strong anti-Beijing suspicion that prevails on Capitol Hill in order to sway opponents. The Democratic president faces stiff resistance within his own camp from some lawmakers who fear the accord could lead to US job losses. Republicans are traditionally more supportive of free trade, but this year there is disunity on the issue within their caucus. According to a law passed in June, Congress will have the ability to vote up or down on the accord, but not the chance to amend it. The process will take months, and the White House has refused to provide a timeline. For Paal, if TPP is indeed "a message to Beijing" that the United States intends to solidify its influential role in Asia, it should not be interpreted as one of exclusion. "If China is successful in bringing its economic reforms to completion -- that's a big hypothetical -- in two, three or maybe five years, they themselves will want to be part of TPP," Paal said, adding that China could view it as a powerful growth engine at a time the Asian giant's economy is flagging. The 12 nations that have reached agreement on the TPP after seven years of negotiations are: Australia, Brunei, Canada, Chile, Japan, Malaysia, Mexico, New Zealand, Peru, Singapore, the United States and Vietnam.